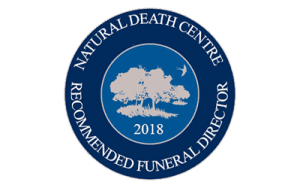 We can offer many different styles and colours of hearses as part of the funeral arrangements. Or perhaps you have a special vehicle that you own that you would like to use to transport your loved ones coffin. We are happy to advise and support you with this. 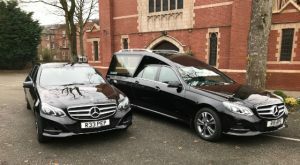 For something traditional we have a plain black Mercedes hearse and matching limousines. Or silver hearse and limousines. This white hearse was imported from Belgium it is a VW ‘type 26’ Bay coach built hearse. Family members can follow in matching stretched VW Beetles if they wish. Another colourful hearse option is a flat bed lorry. A beautiful red and blue 1950 Leyland Beaver with a special plinth on the back for the coffin and flower tributes. We also have a Morris Minor Traveller hearse. For a motorcycle funeral we can provide four different options of motorbike and side car hearses. A classic style Triumph, a Cafe Racer Triumph, a Suzuki Hayabusa or a silver Harley Davidson hearse. It is possible for a relative to ride pillion on the motorbike on this very special final journey. Horse drawn hearses are available with either 2 or 4 horses. These classic hearses are available in black or white. If family members would like non-limousine transport we can provide a Black Chrysler or Silver Mercedes people carrier.